When I carry out some experiments, I usually make synthetic data sets generated by some probability distributions. Especially, Zipf distribution is frequently used for a synthetic data set. Zipf distribution is one of the discrete power law probability distributions. 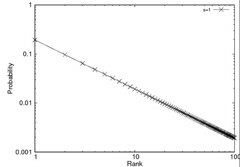 You can get detail information from Zipf’s law in Wikipedia. Anyway, I attached my own java class for zip distribution. Below graphs are generated by my own java code and the gnuplot. // the next() method returns an random rank id. 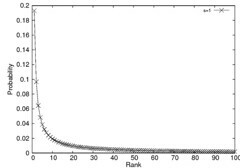 // The frequency of returned rank ids are follows Zipf distribution. // This method returns a probability that the given rank occurs. 안녕하세요? 저도 bart님 블로그에 자주 방문합니다. MPP와 GraphDB 관련한 연구들을 하시나 봅니다. 저도 관련해서 관심있게 들여다 보고는 있는데, 아직은 해볼 여력이 안되는듯 싶더군요. 저는 XML쪽 하다가 요새는 Multi-core쪽 을 해볼까 하고 있습니다. 이 큰 줄기인 듯 싶습니다. 사실은 저도 공간 데이터베이스 쪽으로 공부하다가 박사과정 올라오면서 분야를 바꿨답니다. 시작한지 얼마 안되서 아직 많이 부족합니다. Thanks for this good solution for zip. Its working like a charme, but it is a little bit slow, because of the while loop in the next()-Function. Do you have a solution to make it faster?